Adiponectin Antibody is affinity chromatography purified via peptide column. Adiponectin antibody was raised against a 15 amino acid synthetic peptide from near the carboxy terminus of human adiponectin. Adiponectin Antibody is supplied in PBS containing 0.02% sodium azide. Adiponectin antibody can be stored at 4 degree C for three months and -20 degree C, stable for up to one year. As with all antibodies care should be taken to avoid repeated freeze thaw cycles. Antibodies should not be exposed to prolonged high temperatures. Adiponectin Antibody: Adipose tissue of an organism plays a major role in regulating physiologic and pathologic processes such as metabolism and immunity by producing and secreting a variety of bioactive molecules termed adipokines. One highly conserved family of adipokines is adiponectin/ACRP30 and its structural and functional paralogs, the C1q/tumor necrosis factor-alpha-related proteins (CTRPs) 1-7. Unlike the CTRPs, which are expressed in a wide variety of tissues, adiponectin is reported to be expressed exclusively by differentiated adipocytes. These proteins are thought to act mainly on liver and muscle tissue to control glucose and lipid metabolism. An analysis of the crystal structure of adiponectin revealed a structural and evolutionary link between TNF and C1q-containing proteins, suggesting that these proteins arose from a common ancestral innate immunity gene. It is present in high levels in normal human plasma, but is reduced in obese subjects and often in those with increased insulin resistance and type 2 diabetes, suggesting that adiponectin may be a useful pharmacological target in various metabolic diseases. 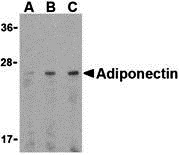 Adiponectin antibody can be used for the detection of adiponectin by Western blot at 0.5 to 2 mug/mL. Antibody can also be used for immunohistochemistry starting at 10 mug/mL. For immunofluorescence start at 20 mug/mL. Western blot analysis of adiponectin in HL60 cell lysate with adiponectin antibody at (A) 0.5, (B) 1, and (C) 2 μg/mL. 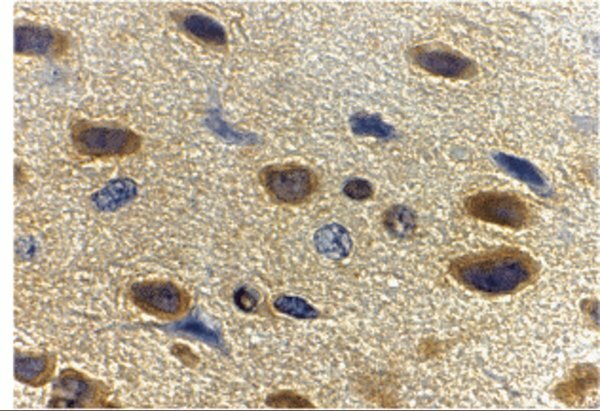 Immunohistochemistry of adiponectin in rat brain tissue with adiponectin antibody at 10 μg/mL. 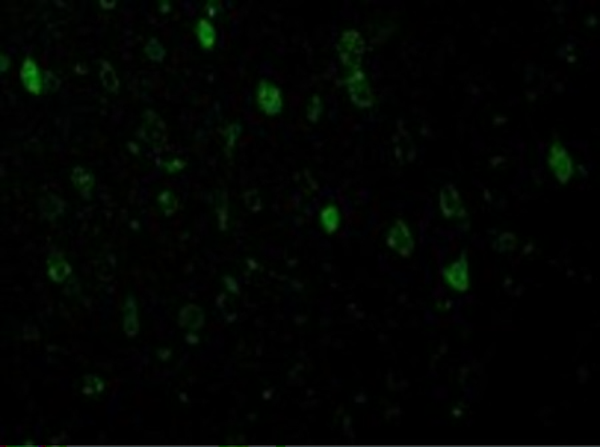 Immunofluorescence of Adiponectin in Rat Brain cells with Adiponectin antibody at 10 μg/mL. 1. Reduced total adiponectin expression is associated with glucose intolerance and gestational diabetes mellitus.